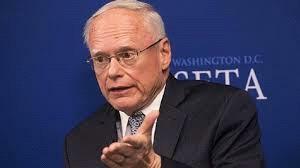 AMMONNEWS - US Syria Envoy James Jeffrey is leading a delegation to Turkey, Jordan, and Israel September 1-4 to discuss Russian allegations about terrorists staging a possible chemical weapons attack provocation, the State Department said in a press release. Russian officials have said they have evidence that terrorists in Idlib are currently preparing to conduct a false-flag chemical weapons attack in order to spark a military intervention by the United States and its allies. Jeffrey, who is making his first overseas trip as Special Representative, will be joined by Near Eastern Affairs Deputy Assistant Secretary and Special Envoy for Syria, Joel Rayburn, according to the release. The US diplomats will discuss with Israeli government officials their security concerns in Syria including Iran's destabilizing activity in the region. "They will also underscore that the United States will respond to any chemical weapons attack perpetrated by the Syrian regime," the State Department said. Jeffrey and Rayburn will also reiterate to their Jordanian and Turkish counterparts that the United States believes a military offensive in Idlib will escalate the crisis in Syria. Meanwhile, Turkish Foreign Minister Mevlut Cavusoglu said on Friday that he had met with President of the Syrian Negotiations Commission Nasr Hariri to discuss the situation in the Syrian province of Idlib. Speculation about the possibility of a chemical weapons attack in Syria has grown in recent weeks. Earlier on Friday, Russian Foreign Minister Sergey Lavrov reiterated the warning, saying that a provocation involving the use of chemical weapons is being planned in the province of Idlib. Lavrov said Russia has transferred the evidence of the ongoing preparations for chemical assault staging to both the Organization for the Prohibition of Chemical Weapons and the United Nations. On April 14, the United States, the United Kingdom and France launched over 100 missiles on multiple targets in Syria in response to the alleged chemical weapons attack in the Syrian city of Douma. Russian President Vladimir Putin said that the strikes were carried out in violation of the norms and principles of international law.